Well, definitely actually. That was just a blatant link to Carlsberg. You see, I’ve just returned from a week in Denmark, the initial research stage of a wider project to support their league and clubs with fan experience and growth. Yesterday, after a smooth flight and landing, and after I’d negotiated Manchester Airport (it’ll be great when it’s finished) and joined the M6 for the first leg of my journey, I immediately encountered roadworks. They went on forever, with little or no information on how long they’d last and certainly no apology for the inconvenience of miles and miles of narrowed lanes and fifty mph limits (doesn’t stop lorries undertaking at nearly 60 though I notice) with sporadic glimpses of anyone actually doing anything. I hadn’t forgotten what roadworks were like – Denmark has them too – but there was a difference. On their roads there were plenty of signs that said SORRY and explained what was happening. I can’t speak Danish but there were also clear markers for how long the roadworks would last for and you got the feeling they’d tried hard to minimise them into small blocks where they needed them, not just endless ten to twenty mile stretches that were purely for the convenience of the companies working on them. Oh, and there were actual people working too. The differences between the countries in terms of roads were stark. Just as they were in football. 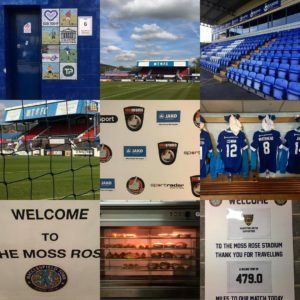 This season, I’ve attended roughly thirty EFL games, plus a number of National League and FAWSL games. This research trip took in several games over a short space of time as the Superliga finale takes place with its end of season deciders – a mini league to decide the top places and two groups in a mini-cup format to decide the final Europa League spot and the relegation places. It’s complicated but fun, and tense too. There is a lot riding on the games. And it was fascinating to compare the two countries and look for opportunities for improvements. It was a two-way street. There is a lot the Danes can learn from England but just as many things that work the other way too. One match saw the home team (Lyngby) lose two-nil in a first leg, seemingly putting them out of the tie. They hadn’t played that well, didn’t create many chances and it could easily have fizzled out as a spectacle. I’ve been to this kind of game hundreds of times over the years, with a good percentage of fans drifting out well before the final whistle and a chorus of derision from those who do stay until the end. But not this time. The home fans were singing as loudly at the end as they were at the beginning, constantly willing their team on, beating drums and chanting which in turn spurred the home players to make a final push. I even commented to my colleague Mark that they deserved a goal for their unrelenting positivity and support and sure enough, they scored deep into injury time, thus keeping the tie alive for the second leg. We’ll never know if they’d have got that goal in a half empty stadium with the crowd jeering them, but I’d like to think I know what would have probably happened. The sight of Brondby fans, descending en masse on AC Horsens will live long in the memory. Five thousand travelling fans had made the not insignificant 160 journey from the outskirts of Copenhagen: nearly 5000 of them decked in bright yellow with navy trim. Most met in the city and marched to the stadium (a sight in itself) and then, once inside, they formed a giant yellow wall on one side of the stadium, loudly chanting, waving flags and illuminating the Spring evening with occasional fireworks from more than an hour before kick-off until the last whistle. It was as much of a spectacle as the game itself, and it’s surely why the game of football was dreamt up in the first place. To see two sets of supporters making the match such an incredible experience was a real highlight. And the Brondby fans would have got away with it too, if it hadn’t been for those pesky late Horsens goals – one 6 minutes into injury time – that turned the match (and the league championship) on its head. The away fans did go a bit OTT after that and the behaviour of some mindless Brondby fans cannot be condoned, but one thought endured: would anyone (including the home club) have swapped what must have been one of the most amazing, colourful and unforgettable nights of the season for something more sanitised? I doubt it. Arriving at Aarhus a couple of hours before the first leg of their play-off semi-final, we walked towards the stadium from the car park to meet our host, Jonas. A smartly dressed man walked alongside us as we made our way to the main entrance. He chatted with us about the fantastic weather and how there was no more beautiful place in the world when the sun was shining but (as everyone was at pains to tell us these past two weeks) such glorious weather was unprecendented in May in Denmark. He only left us to greet and shake hands warmly with a family of four and then hugged Jonas when he reached him like they were long lost friends. Jonas told us after he’d gone that he was the club’s first team manager. He was 120 minutes from the biggest game of the season, and he probably had a multitude of things on his mind, but his only thought was to be friendly, welcoming and engaging with the people that really matter; fans and colleagues. And a couple of English blokes from The Fan Experience Company, of course. Some managers in England – the Cowley brothers at Lincoln City if we’re naming names – get it but not that many more do, or they don’t demonstrate it if they do. 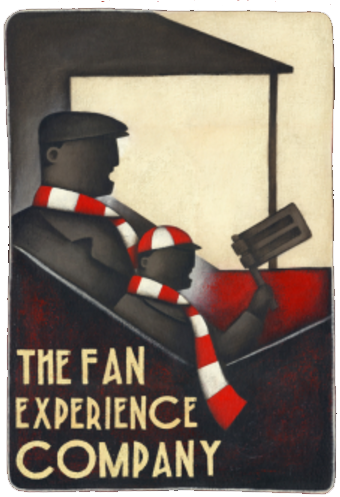 True and genuine fan engagement begins at, or very near to, the top people within the club. We did some fan engagement work with Venue Inc at the NFLUK London games last year and some parts of the trip were very similar in the way the clubs handled ‘off the pitch’ activities. We’ve never pretended that what happens on the pitch isn’t important – it’s vital – but only the managers and players can control that; with help from the fans of course. Therefore, the rest of the club can focus on what happens off the pitch and it was here that the difference was clear. 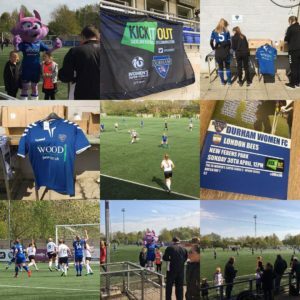 There were more activities for fans – especially kids, zones with many places to sit offering opportunities for them to meet friends, drink beer, eat ridiculously large sausages and enjoy each other’s company before and during the game. And at any point during the matches, very much like the NFLUK games, there were people enjoying themselves on the concourse. The focus was not exclusively on the pitch. I often shake my head when a club in England has one or maybe two small refreshment kiosks and a queue that stretches half the length of a football field. At one game I attended this season, the family next to me missed three of their team’s four goals (two of which because they were still in the half-time queue). In Denmark, there were multiple outlets selling beer, soft drinks and (mainly) sausages. Sure, the choice is a little limited (and not ideal if you don’t like sausages) but the availability isn’t. And you know what? There were always people buying from them with some visiting the kiosks maybe two, three or four times. I’d wager that far more food and drink was purchased because it was so readily available. No-one had to miss a goal if they didn’t want to. The cultures of our two countries are different and maybe it’s impossible to compare them but, for more, the thing that stood out was good-natured tolerance. OK, every now and again it might backfire – as happened with Brondby fans at Horsens (albeit in late-changing circumstances that no one would have predicted earlier in the game) – but the Danish approach seemed to be about trying to allow as much as possible to happen without unnecessary intervention or sanctions. Stewards were welcoming, accommodating, friendly and smiling at all times; police formed a barely visible presence; fans stood inside the stadium (usually in designated areas); fireworks (we think they were ‘safer’ fire-sticks that gave off smoke but can’t be sure) were plentiful, beer was consumed wherever you were (standing or sitting) and children played freely. It appeared to be a planned strategy contributing to a subtle but significant impact on the fan experience. And there were no other circumstances that meant it was vastly different to UK football. Only one of the three games that I saw had a crowd under 10,000 for example and we had the same weather as we often experience at the business end of the English season too. The attitude of the clubs and their people were the main differentiator. None of what we saw was rocket science; it just needed commitment and focus and that comes from within: from people who recognise what needs to be done and can make it happen. The culture, and that’s the main thing, was one of doing the right thing for fans and the community. Leadership,of course, is always the crucial factor, but the senior people we met on our trip, left us feeling assured that the will is there. But we’d also urge them to retain the elements that make the Danish Superliga and its clubs unique and that’s a fantastically powerful combination of entertainment on the pitch, genuinely looking after fans off it and not taking themselves too seriously. I told him I wished more clubs had that ‘problem’.